The word "socialism" gets thrown around a whole bunch in our life politic lately. It's a catch-all slur on the right, so overused and dumbed down that it might as well mean nothing. If you've reached a point in your thinking where you can't tell the difference between Canada and Stalin's Soviet Union? Honey, it's time to reconnect with reality. But socialism also gets dreamily misrepresented by the left. Even setting aside the gulag and the reeducation camp, the dismal slog of procedure and protocol-driven bureaucracies is a very real thing. It's a lifeless, artless, joyless horror. Doing our life together right...in a way that preserves our humanity...is a challenge. There's been a meme circulating recently among my leftist friends that highlights that conundrum. It's the "socialist snowplow" meme, in which a line of giant department of transportation trucks with plows affixed rumble down the highway. "Look! You benefit from Socialism! You conservative morons!" Or something lovely, polite, and bridge-building like that. Here's the thing. The face of socialism in America will never be a giant state owned truck. 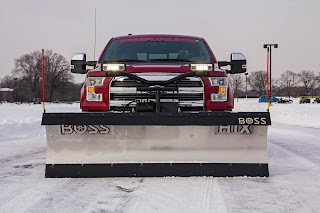 If socialism ever has a snow-face in America, it'll be the face of a Ford F-150. Why? Because I've watched the way my purple state has managed snow the last few years, and I've been honestly impressed. I grew up in Virginia. It's my home. It's where I met my wife. It's where I went to high school and college and where I've raised my family. Back when I was a young man, the state exclusively took the big plow route. Giant trucks, with huge plows, part of the Virginia Department of Transportation fleet. They did a good job of the highways, but there weren't enough of them to get back to the roads where people lived. Plows would come through days after a storm. You'd wait, and wait. Now, my state still has those big trucks. But it also works with what must be thousands of small contractors. During the recent blizzard...a huge, huge storm, 32 inches of snow hitting a southern state...the first wave of trucks hit at the height of the storm. What we saw in the neighborhoods were not Big State Trucks. These were working men, contractors and landscapers, driving the trucks that they use in their day to day labors. F-150s, 250s, and 350s, mostly. None of them gussied up with leather and nav and the coddling farkles. Just 4x4, and room to move a crew. Honest working trucks. Those humble Fords hit and hit and hit again, multiple passes every day, buzzing around like worker bees. Within 24 hours after the last flake fell, for single largest snow I have seen in my lifetime, the roads were passable. And that, I think, is the challenge of blind ideological responses to anything. What should matter, if we are American, can't be ideological purity. It's reality, the simple, honest reality of getting things done to make life better, doing them well, and doing them together with a sense of common purpose.